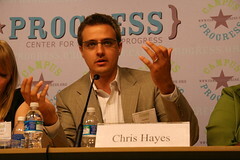 I like MSNBC’s Up with Chris Hayes. It’s TV for thinkers, at least most of the time. But this past weekend, in a discussion about the collapse of truth in media, Hayes said something that almost had me throwing my coffee at the T.V. His comment was a response to a plea from good ol’ Amy Goodman of Democracy Now for poor people, especially poor people of color, being able to speak for themselves in media. She said truth in media is “larger than a truth that is yes or no…” speaking to the fact that, even in the midst of an economic crisis that is having a disproportionate and devastating impact on Blacks and Latinos, almost no poor Black or Latino people are able to speak about the economy in the media. Goodman’s point was well taken. There are many societal “truths” constructed by the media, not least of which is that only educated experts are qualified to speak to issues. Mainstream media, even much of the left media, rarely allows poor people to speak for themselves, neither about the realities with which they live, nor about the solutions they would propose to problems that most directly affect them. Excluding those most impacted by issues of economic inequality from the discussion among public intellectuals in the media comes at a real cost. When we support a dialogue about the economy absent the perspectives of those who have lost the most, and have the most to gain through deep and lasting change, we reduce real problems facing real people into nothing more than issues to attract the votes of middle-class people. That’s when I got angry. You don’t get to talk about poor people like they don’t matter. For most of my adult life, I’ve been a community organizer. That means I’ve worked with people on the down side of unjust power relations – folks who need to exercise power in numbers because when we act as individuals we are treated like we don’t matter. Realizing that we are not alone in our troubles helps people who are rarely listened to by “experts” like Chris Hayes lift themselves out of despair. The circle of recognition grows exponentially larger when those who have been vilified as leaches and denigrated as losers are able to tell their stories through the media. Nothing else has as broad and immediate an impact. In fact, not being able to tell our stories via the mainstream media is one of the ways we are swept under the rug and kept out of power. Believe me, as long as the only audience that counts to media makers is white and middle class, media as a means of advancing racial equity will only yield change in small and mostly superficial increments. The white middle class perceives itself as having too much to lose and not enough to gain through achieving racial justice. And that resistance is magnified by the fact that our invisibility in media means that relatively few middle class whites know our stories. But when poor people of color are included, we not only open doors to reconciliation and change. Change is created by the simple act of including us. So the next time Mr. Hayes finds himself bemoaning the lack of movement on issues of justice, maybe he should ask himself what role media plays in writing those most likely to be that movement out of the story.